In February, 1982, Syria’s president Hafez al-Assad murdered between 30-40,000 people in the city of Hama. 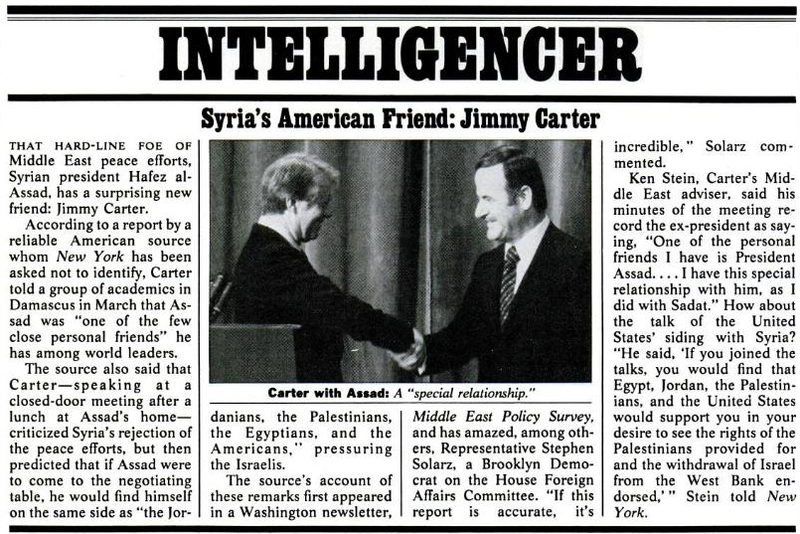 A year later, in March 1983, Jimmy Carter referred to the mass murderer as “a close personal friend” who he has a “special relationship” with. He expressed the hope that if Assad would come to the negotiating table, he could be on the same side as the Egyptians, Palestinians, Jordanians, and Americans in pressuring – Israel. All of this was recorded in New York Magazine, June 6, 1983, and verified by Carter’s friend and advisor, Kenneth Stein, who would later famously break with Carter over the lies he wrote in his 2006 book.